CHINATOWN — Stepping inside Strings Ramen Shop will be a small culinary tour to Japan. Guests will be greeted with a hearty "irrashaimase" — "welcome" in Japanese — and they'll leave to a chorus of "arigato," or "thank you." In between, the group behind the restaurant aims to bring diners an authentic ramen shop experience unlike any other in the city. "Most Japanese restaurants in Chicago have introduced ramen on their menus, but we're really focusing on the noodles — the flavor and texture of the noodles," said Matt Nakano, a chef and co-owner at the just-opened Strings at 2141 S. Archer Ave.
For the uninitiated, Japanese ramen is nothing like the microwave able sodium bombs popular with college kids on a budget. Instead, authentic ramen is like a noodle soup, laden with fresh vegetables and meats (duck or pork) floating in a savory broth. It's comfort food in a bowl. Nakamo said the team behind the restaurant, which includes chef Nobuo Katake and chef-slash-designer Kee Chan, has imported from Japan a custom-built machine capable of mixing, cutting and perfecting their noodle recipe in mass quantities — enough to supply the team's planned franchise expansion. But for now, the team is focused on kicking out only a select handful of ramen dishes, Japanese street-food inspired sides and a few rice dishes at its Chinatown location. 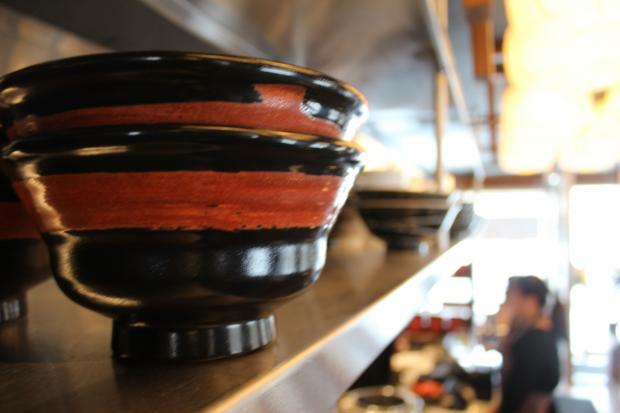 "We didn't want to open without putting something out there that was exactly like we wanted," said Nakano, of Andersonville. Popular so far is the classic tonkotsu ramen, which Strings describes as "48 hours boiled black boar bone broth served with binishoga, mayu, garlic oil, fresh crushed garlic, sesame seed, scallion, menma, and boiled egg." Designed by Chan, whose work includes dynamic modern overhauls of restaurants in Chinatown and beyond, Strings has an open floor plan — only a waist-high countertop separates diners from the cooks. And the tables are perfect for squeezing a few pals around to slurp noodles together. "Ramen is a social thing to sit and have a good time over," Nakano said. As with many just-opened restaurants, there are some kinks to be worked out. The restaurant is currently cash-only as the owners work to perfect the credit card system, and Nakano said carry-out ordering is a work in progress as they find the best way to keep the dishes hot. But Nakano, Chan and others believe the debut of Strings marks something big in the city's ethnic dining scene. They may be right — Strings sold out of food on its Jan. 31 opening night. Like ramen shops in Japan, New York and Los Angeles, Strings will stay open late, until 2 a.m. on Friday and Saturday. The rest of the week, it closes at midnight.